The City of Mendoza is the most important in the region of Cuyo. Famous for lodging Mount Aconcagua, for its Malbec wines and for being the cradle of the heroic deeds of Liberator General San Martín, Father of this nation, it is one of the most beautiful and neat cities in the country. Accommodation venues represent another reason for the city to feel proud. It manages to combine traditional lodgings with new accommodation trends at boutique wineries, an increasingly popular option for visitors. Capital of the province bearing the same name, Mendoza, and nestled in the foothills of the Andes Mountain Range, it gives shape to an incredible oasis created by man with the help of the Mendoza and Tunuyán Rivers, which have been wisely channeled into a huge irrigation system that gives life to everything it touches. The climate in Mendoza is moderate-temperate, though its mountains provide a certain degree of aridity. Summer temperatures range between 18 and 33º C; days are very hot and nights are fresh. In Mendoza in winter, the ski season, minimum temperatures drop to 3º C whereas maximums hit 16º C.
The City of Mendoza may be accessed either by air, landing at its international airport called Francisco Gabrielli - El Plumerillo, or by land through National Routes 7 and 40. Sightseeing tours show visitors the history and culture of its dwellers, which may also be appreciated in its museums, its cafés, squares, institutions and public buildings. 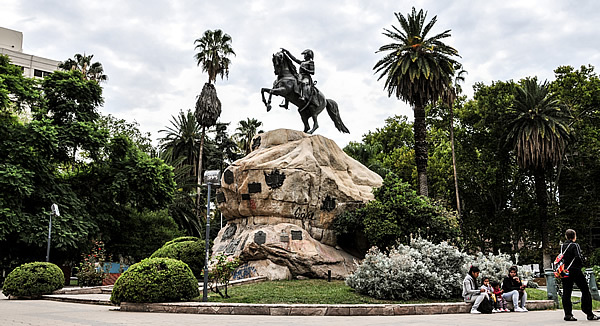 Owner of a historical tradition, Mendoza preserves countless memories from the times of San Martin’s ordeal through Mount De la Gloria, el Plumerillo, San Martín Park and a variety of museums whose treasures document the passing of the Argentinian hero through this region. But also nature rules in this city that serves as a starting point for all kinds of adventure activities and high country sports, such as mountaineering, climbing and ski, as well as river rafting, which is practiced in the Mendoza River, with some very difficult stretches highly praised by the best sportsmen in the world. The Wine Route is another ancient and renovated attraction in town. Visitors may go around several wineries tasting the wines produced at those venues and which have made this region famous worldwide. No wonder the slogan "the land of good sunshine and good wine" remains intact, more accurate than ever. Are you planning a trip to Mendoza? The easiest way to find accommodation in Mendoza and find the best prices. All dining options in Mendoza located on a map and contact details. What to do in Mendoza? Cultural options and captive walks in Mendoza told by our journalists.